Posted by Jessica Behrman on Monday at 9:00am . Industry partnerships play a vital role in the way that many ATE projects and centers plan for, design, and implement their various programs, projects, research, and more. Industry partners might act in an advisory role; assist with curriculum or professional development; offer student opportunities for growth and innovation; support instruction, program costs, or research; or offer workplace-based learning opportunities. In this month’s From the Archive blog post, we look at resources, created by ATE project and centers like yours, that help describe a variety of industry partnerships models and explore how one might develop or sustain such a partnership. This Working Partners Toolkit, which is comprised of eight partnership models, a number of case studies, and other resources and data, was crafted to help educators strengthen their relationship with industry. A short summary of each of the eight partnership models can be found on this 2-page handout; visit the Working Partners Project website for more information. Below are three case studies from the Toolkit. These studies are gathered from successfully initiated and sustained education-industry partnerships and illustrate implementation strategies, challenges, and impacts for the various partnership models. This program support case study discusses the partnership between Richmond Community College, Duke Energy, and others from the electric utility industry. These partnerships resulted in the creation of the Electric Utility Substation and Relay Technology Program (EUSRT) at Richmond Community College. This advisory board case study covers the Business Leadership Team model (BILT), a variation of the standard advisory board. The creation of the model and its adoption across sectors is discussed. This incubation and entrepreneurship case study discusses The Facility, which consists of labs and classrooms used by Edmond Community College's academic program by day and by industry partners and innovators to train, test, create, engage, and collaborate during the time when the labs and equipment are not in use. For more archived resources by Working Partners: Documenting the Impact of Industry Collaboration within the ATE Community, visit the ATE Central Archive. This 2018 webinar, provided by the Centers Collaborative for Technical Assistance, addresses internal and external stakeholder partnerships for grants. During this presentation, Elaine Johnson, PI and Executive Director of Bio-Link, Ann Beheler, PI and Executive Director of the National Convergence Technology Center, and Marilyn Barger, PI and Executive Director of the Florida Advanced Technological Education Center discuss the role partnerships play in the work of their respective centers. Specific topics addressed include characteristics of a partnerships, partnerships with business and industry, education partners, and how to best approach new partners. For more archived resources by ATE Collaborative Impact Project, visit the ATE Central Archive. This resource from Louise Yarnall, Raymond McGhee, and Joseph Ames includes information on a project which studied industry partnerships with ATE projects and centers. The five page PDF contains short descriptions of a Partnership Study and Instruction Study. Additionally, a diagram illustrates the Partnership Model which includes Strategic Need, Formation, Partnership Capital, and Outcomes. Other sections of the resource include Industry-Community College Partnership: What Research Shows, Forming Partnerships-Organizational Boundaries, and STEM Workforce Instruction Features Snapshot. For more archived resources by Community College Partnership's Instructional Impacts, visit the ATE Central Archive. Posted by Madeline Patton on April 1st at 4:00am . As the team at ATE Central ramps up to create the ATE Impacts 2020-2021 publication, it is asking the ATE community for nominations of projects with promising outcomes or interesting activities to spotlight. Nominate your project or someone else’s at https://www.research.net/r/ProjNom. The book is a great opportunity to increase awareness of the innovations developed by principal investigators of Advanced Technological Education (ATE) projects and centers and to promote technician education in general. In addition to informing people who read the book, the dynamic photos and compelling data that projects and centers have provided for previous editions have often been re-purposed for other technician-education outreach. The American Association of Community Colleges, a partner on the ATE Collaborative Outreach and Engagement (ACOE) project that includes the ATE Impacts book and blog, has used ATE Impact photos in its digital and print publications, website, and ATE Principal Investigators’ Conference displays. The ACOE project has displayed large versions of ATE Impact photos at education and industry conventions. The National Science Foundation, which funds the Advanced Technological Education (ATE) program and the ATE Impacts book and blog, has reprinted ATE Impact photos too. 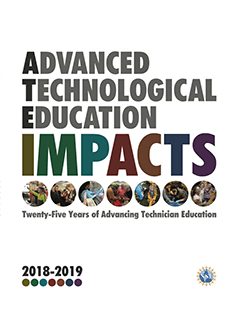 Jim Pytel, principal investigator of the Flipped Classroom Resources for Electrical Engineering Technicians project, reports that being one of the 28 projects featured in ATE Impacts 2018-2019: 25 Year of Advancing Technological Education may have contributed to more people accessing his BigBadTech videos. From October 2018 to March 2019 the project’s YouTube channel with 600 instructional videos gained 5,000 subscribers for a total of 27,600 people. “I’ve got no direct evidence tying the increase in interest to the ATE Impact book, however, both the book and the ATE Principal Investigators’ Conference are a great way of disseminating this work among my peers,” Pytel wrote in an email. Posted by Madeline Patton on March 4th at 12:00pm . As Silvia Torrico explains it, she and her sister Evelyn were always strong math students so they enrolled at Mount San Antonio College (Mt. SAC) intending to become engineers. However, “there was just something about it that wasn’t working for us,” she said. They read a flyer about the college's teacher preparation program and then went to an information session where they heard about the Mt. SAC STEM Teacher Preparation Program (STEM TP2). This Advanced Technological Education (ATE) project’s strategies for helping community college students become STEM teachers include hands-on teaching opportunities, two University of California, Irvine (UC Irvine) courses, and authentic STEM research projects. At a subsequent meeting where they learned more about STEM TP2 from Iraj B. Nejad and Charles G. Newman, principal investigator and co-principal investigator respectively, Silvia Torrico said there was a pivotal moment when the professors talked about teaching as a way to change the future. Posted by Jessica Behrman on February 19th at 9:34am . Diversity and inclusivity are important goals of the ATE program; projects and centers--along with STEM educators, industry, and other community partners--work diligently to ensure the full participation of women, persons with disabilities, Veterans, underrepresented minorities, and others, as these groups pursue STEM education, workforce development training, and employment in STEM fields. In this month’s From the Archive blog post, we highlight the work of three ATE projects and centers that are addressing the challenge of engaging female students in STEM disciplines. The resources below include one college’s plan to increase enrollment and retention of women in their engineering program, a best practices guide for recruiting and retaining girls, as well as a few case studies about successful strategies and practices. For additional resources about women in STEM, check out the ATE Central Resource Portal. Posted by Madeline Patton on February 4th at 9:00am . Seethal Meda’s poster summarizing the discoveries she made during a biotech internship illustrate both her biotechnology skills and the power of synergy within the Advanced Technological Education (ATE) program. The poster she presented during the student showcase at the 2018 ATE Principal Investigators’ Conference featured dazzling photos of differentiated cells illuminated with immunofluorescence as they responded to the “knock-out gene” that a start-up company agreed to have Meda investigate. Her slides and the text descriptions of procedures she executed in the lab at Montgomery County Community College (MCCC) in Blue Bell, Pennsylvania, provide prospective employers with evidence of her advanced biotechnology skills. The complex laboratory tasks that she carried out and described in the poster’s text can be traced back to ATE investments in curriculum and faculty development. And, now the standard operating procedures that Meda developed to conduct her research project are part of one of the modules accessible via the Instructor’s Portal that the Northeast Biomanufacturing Center and Collaborative (NBC2) offers as a free resource for high school and college educators. Posted by Kendra Bouda on January 22nd at 10:00am . A special thanks to Rachel Flynn for contributing this month’s From the Archive blog post. Rachel is a recent graduate of the University of Wisconsin-Madison iSchool. Many ATE projects and centers extend the scope of their reach by developing materials to be used in K-12 classrooms. These STEM-focused materials teach students a variety of concepts related to science, technology, engineering, and math; many of the materials that are made available through the ATE Central Archive can be used and adapted to fit a variety of classroom settings. In this month’s From the Archive blog post, we’re highlighting the work of three ATE projects and centers that support the education of middle school students in STEM. Resources featured include a workbook about energy, an assortment of lesson plans, and an activity designed to teach middle school students about manufacturing. For more information, explore the links provided below. To find more resources in the Archive geared towards middle school students, try browsing ATE Central by Education Level. Posted by Madeline Patton on January 7th at 11:00am . Three National Science Foundation (NSF) program directors are encouraging ATE principal investigators to become involved in The Future of Work at the Human-Technology Frontier (FW-HTF) and Harnessing the Data Revolution—two of NSF’s Ten New Big Ideas for Future Investment—because they have the potential to overlap with technician education. Berg and two other program directors—Robert Scheidt and Stephanie August—presented information about these funding opportunities to the 26 ATE center principal investigators who the PTFOW project had gathered as an ATE Leadership Caucus to help inform its work over the next four years. The project led by Principal Investigator Ann-Claire Anderson, vice president of special projects at the Center for Occupational Research and Development (CORD), seeks to enable the ATE community to collaborate regionally and across disciplines with industry partners to transform associate degree programs to prepare US technicians for the future of work. The project’s 10 industry advisors also attended the meeting. At the meeting the ATE educators and industry advisors identified the following technologies as drivers of transformative workplace changes: artificial intelligence, the internet-of-things, cybersecurity procedures, advanced robotics, digital design, and prototyping. See http://preparingtechnicians.org for more information about the ATE Leadership Caucus meeting and the project’s podcasts, regional convenings, and workshops. Posted by Jessica Behrman on December 17th, 2018 at 7:00am . Part of our focus at ATE Central is to create pathways to information and experts that can support and strengthen the work of ATE grantees. ATE Central recently sat down with Farra Trompeter, VP of Big Duck, a communications firm that works exclusively with nonprofits based in Brooklyn NY, to discuss how branding and marketing can enhance the work of projects and centers. Please tell us a little bit about Big Duck and your role there. Big Duck (www.bigducknyc.com) develops the voices of determined nonprofits by creating strong brands, campaigns, and teams. We specialize in working with nonprofits experiencing significant growth and change. I’ve been a member of Big Duck’s team since 2007. As Vice President, I guide organizations through major brand overhauls, fundraising campaigns, and much more. I also speak around the country, training nonprofit professionals on marketing, online fundraising, and donor engagement. You can learn more about me here and connect directly via Twitter via @Farra. What exactly is branding and why should ATE grantees be concerned about branding their project/center work? A brand is your project or center’s voice. It’s what your audiences hear, see, experience, and feel—and the impression that is formed as a result of their experiences with you. Your voice may be disjointed, murky, and barely louder than a whisper. Or your voice can ring out, differentiate, and reverberate. A strong brand isn’t just a temporary fix or a website update. It’s built for the long haul, often to embody a new strategic plan, the vision of a new leader, or other seismic shifts. Rebranding means expressing that vision deeply and authentically, internally and externally. For a project or center, a strong brand can help you reach and engage with students, faculty, program partners, and other key audiences. It can also help you build relationships with funders and donors for programmatic sustainability. Posted by Madeline Patton on December 3rd, 2018 at 10:00am . Three years after enrolling in Highline College’s networking associate degree program, Colleen Day is teaching networking as a tenure-track faculty member of Renton Technical College in Renton, Washington. The mid-career change is still a bit of a surprise to Day who was initially seeking an associate degree. She thought this credential would help her get a networking job with a medium or large business. She had taught herself networking skills while running several small businesses, but other employers were not convinced she had information technology skills. Amelia Phillips, professor of computer information systems and computer science at Highline College in Des Moines, Washington, noticed Day’s computer skills and teaching talents during her first semester at Highline in 2015. “She was in my Networking Intrusion Detection class and my Linux Administration class, and she was helping the other students. That’s what it was. I could see. She would figure it out, and then she would figure out what the other students needed … students help each other, but not at that level,” Phillips said.